The star leads them to Jesus' home in the town, where they worship him and give him gifts. The wise men are then given a divine warning not to return to Herod, so they return home by a different route. Many Christians believe the star was a miraculous sign. Some theologians claimed that the star fulfilled a prophecy, known as the Star Prophecy. Astronomers have made several attempts to link the star to unusual celestial events, such as a conjunction of Jupiter and Venus, a comet, or a supernova. The subject is a favorite at planetarium shows during the Christmas season, although the account describes Jesus with a broader Greek word παιδίου, which can mean either "infant" or "child" (paidion), rather than the more specific word for infant (brephos), possibly implying that some time has passed since the birth. The visit is traditionally celebrated on Epiphany (January 6) in Western Christianity. 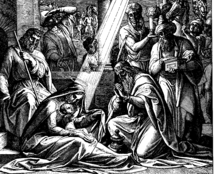 Many scholars who see the gospel nativity stories as later apologetic accounts created to establish the Messianic status of Jesus regard the Star of Bethlehem as a pious fiction. Aspects of Matthew's account which have raised questions of the historical event include: Matthew is the only one of the four gospels which mentions either the Star of Bethlehem or the Magi. Scholars suggest that Jesus was born in Nazareth and that the Bethlehem nativity narratives reflect a desire by the Gospel writers to present his birth as the fulfillment of prophecy. The Matthew account conflicts with that given in the Gospel of Luke, in which the family of Jesus already live in Nazareth, travel to Bethlehem for the census, and return home almost immediately. Matthew's description of the miracles and portents attending the birth of Jesus can be compared to stories concerning the birth of Augustus (63 BC). [nb 4] Linking a birth to the first appearance of a star was consistent with a popular belief that each person's life was linked to a particular star. 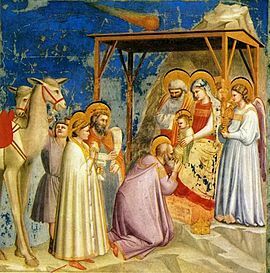 Magi and astronomical events were linked in the public mind by the visit to Rome of a delegation of magi at the time of a spectacular appearance of Halley's Comet in AD 66, about the time the Gospel of Matthew was being composed. This delegation was led by King Tiridates of Armenia, who came seeking confirmation of his title from Emperor Nero. Ancient historian Dio Cassius wrote that, "The King did not return by the route he had followed in coming," a line similar to the text of Matthew's account, but written some time after the completion of Matthew's gospel. Other writers suggest that the star was a comet. Halley's Comet was visible in 12 BC and another object, possibly a comet or nova, was seen by Chinese and Korean stargazers in about 5 BC. This object was observed for over seventy days, possibly with no movement recorded. Ancient writers described comets as "hanging over" specific cities, just as the Star of Bethlehem was said to have "stood over" the "place" where Jesus was (the town of Bethlehem). However, this is generally thought unlikely as in ancient times comets were generally seen as bad omens. The comet explanation has been recently promoted by Colin Nicholl. His theory involves a hypothetical comet which could have appeared in 6 BC. A recent (2005) hypothesis is that the star of Bethlehem was a supernova or hypernova occurring in the nearby Andromeda Galaxy. Although it is difficult to detect a supernova remnant in another galaxy, or obtain an accurate date of when it occurred, supernova remnants have been detected in Andromeda. Babylonian astronomers usually referred to the planet Jupiter as MUL.BABBAR, meaning the "white star." The symbolically royal celestial events were centered on the planet's annual cycle. By June of 2 BC, nine months later, the human gestation period, Jupiter had continued moving in its orbit around the sun and appeared in close conjunction with Venus in June of 2 BC. In Hebrew Jupiter is called "Sedeq", meaning "righteousness", a term also used for the Messiah, and suggested that because the planet Venus represents love and fertility, so Chester had suggested astrologers would have viewed the close conjunction of Jupiter and Venus as indicating a coming new king of Israel, and Herod would have taken them seriously. Astronomer Dave Reneke independently found the June 2 BC planetary conjunction, and noted it would have appeared as a "bright beacon of light". If the story of the Star of Bethlehem described an actual event, it might identify the year Jesus was born. The Gospel of Matthew describes the birth of Jesus as taking place when Herod was king. According to Josephus, Herod died after a lunar eclipse and before a Passover Feast. The eclipse is usually identified as the eclipse of March 13, 4 BC. Other scholars suggested dates in 5 BC, because it allows seven months for the events Josephus documented between the lunar eclipse and the Passover rather than the 29 days allowed by lunar eclipse in 4 BC. Others suggest it was an eclipse in 1 BC. 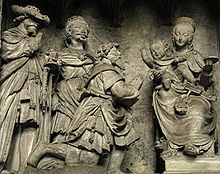 The narrative implies that Jesus was born sometime between the first appearance of the star and the appearance of the Magi at Herod's court. 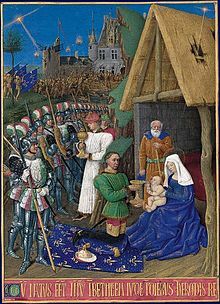 That the king is said to have ordered the execution of boys two years of age and younger implies that the Star of Bethlehem appeared within the preceding two years. Some scholars date the birth of Jesus as 6–4 BC, while others suggest Jesus' birth was in 3/2 BC. The Gospel of Luke says the census from Caesar Augustus took place when Quirinius was governor of Syria. Tipler suggests this took place in AD 6, nine years after the death of Herod, and that the family of Jesus left Bethlehem shortly after the birth. Some scholars explain the apparent disparity as an error on the part of the author of the Gospel of Luke, concluding that he was more concerned with creating a symbolic narrative than a historical account, and was either unaware of, or indifferent to, the chronological difficulty. Simon the Athonite founded the monastery of Simonopetra on Mount Athos after seeing a star he identified with the Star of Bethlehem. LDS members believe that the Star of Bethlehem was an actual astronomical event visible the world over. In the Book of Mormon, which they believe contains writings of ancient prophets, Samuel the Lamanite prophesies that a new star will appear as a sign that Jesus has been born, and Nephi later writes about the fulfillment of this prophecy. The colourful star lantern known as a paról is a cherished and ubiquitous symbol of Christmas for Filipinos, its design and light recalling the star. In its basic form, the paról has five points and two "tails" that evoke rays of light pointing the way to the Christ Child, and candles inside the lanterns have been superseded by electric illumination. In quilting, a common eight-pointed star design is known as the Star of Bethlehem. Star of David - The Jewish symbol of King David, which the Star of Bethlehem is often associated with having been a miraculous appearance of. ^ Matthew 2:5–6. Matthew's version is a conflation of Micah 5:2 and 2 Samuel 5:2. ^ Matthew 2:16 This is presented as a fulfillment of a prophecy and echoes the killing of firstborn by pharaoh in Exodus 11:1–12:36. ^ Judges 13:5–7 is sometimes identified as the source for Matthew 2:23 because Septuagint ναζιραιον (Nazirite) resembles Matthew's Ναζωραῖος (Nazorean). But few scholars accept the view that Jesus was a Nazirite. ^ Augustus' mother was said to have become pregnant by the god Apollo and there was a "public portent" indicating that a king of Rome would soon be born. ( Suetonius, C. Tranquillus, "The Divine Augustus", The Lives of the Twelve Caesars chapter 94, archived from the original on 2006-09-20 ). ^ For example, Paul L. Maier, "Herod and the Infants of Bethlehem", in Chronos, Kairos, Christos II, Mercer University Press (1998), 171; Geza Vermes, The Nativity: History and Legend, London, Penguin, 2006, p22; E. P. Sanders, The Historical Figure of Jesus, 1993, p.85; Aaron Michael Adair, "Science, Scholarship and Bethlehem's Starry Night", Sky and Telescope, Dec. 2007, pp. 26–29 (reviewing astronomical theories). ^ a b c John, Mosley. "Common Errors in 'Star of Bethlehem' Planetarium Shows". Archived from the original on 2008-05-16. Retrieved 2008-06-05. ^ Brown, Raymond Edward (1988). An Adult Christ at Christmas: Essays on the Three Biblical Christmas Stories, Liturgical Press, p. 11 ISBN 0-8028-3931-2; Eerdmans Dictionary of the Bible, Eerdmans (2000), p. 844. ^ a b Matthew 2:2. New Revised Standard Version. ^ Thomas G. Long, Matthew (Westminster John Knox Press, 1997), page 18. ^ Matthew 2:15 The original is from Hosea 11:1. ^ Concordances on the meaning of the word "netzer" on Bible Hub. Retrieved December 29, 2015. ^ Commentaries for Matthew 2:23 on Bible Hub. Retrieved on December 29, 2005. ^ Isaiah chapter 11, verse 1 on Bible Hub with commentaries. Retrieved on December 29, 2015. ^ Nikkos Kokkinos, "The Relative Chronology of the Nativity in Tertullian", in Ray Summers, Jerry Vardaman and others, eds., Chronos, Kairos, Christos II, Mercer University Press (1998), page 125–6. ^ a b c Jenkins, R.M. (June 2004). "The Star of Bethlehem and the Comet of AD 66" (PDF). Journal of the British Astronomy Association (114). pp. 336–43. Retrieved 2016-12-23. ^ Josephus, Flavius, The Wars of the Jews, retrieved 2008-06-07 Translated by: William Whiston. ^ Adamantius, Origen. "Contra Celsum". Retrieved 2008-06-05. , Book I, Chapter LIX. ^ a b Adamantius, Origen. "Contra Celsum". . Book I, Chapter LX. ^ France, R.T., The Gospel according to Matthew: an introduction and commentary, p. 84. See Isaiah 60:1–7 and Psalms 72:10. ^ Raymond Edward Brown, An Adult Christ at Christmas: Essays on the Three Biblical Christmas Stories, Liturgical Press (1988), p. 11. ^ S. J. Tester, A History of Western Astrology, (Boydell & Brewer, 1987), page 111–112. ^ a b c d e Mark, Kidger. "Chinese and Babylonian Observations". Retrieved 2008-06-05. ^ Minnesota Astronomy Review Volume 18 – Fall 2003/2004 "The Star of Bethlehem by Karlis Kaufmanis" (PDF). ^ Audio Version of Star of Bethlehem by Karlis Kaufmanis "The Star of Bethlehem by Karlis Kaufmanis". ^ Simo Parpola, "The Magi and the Star," Bible Review, December 2001, pp. 16-23, 52, and 54. ^ Sinnott, Roger, "Thoughts on the Star of Bethlehem", Sky and Telescope, December 1968, pp. 384–386. ^ Greg Garrison (30 June 2015). "Is this what the Star of Bethlehem looked like? Venus, Jupiter put on a show". Alabama Media Group (AL.com). Retrieved 14 July 2015. ^ Colin Humphreys, 'The Star of Bethlehem', in Science and Christian Belief 5 (1995), 83–101. ^ Mark Kidger, Astronomical Enigmas: Life on Mars, the Star of Bethlehem, and Other Milky Way Mysteries, (Johns Hopkins University Press, 2005), page 61. ^ Colin R. Nicholl. 2015. The Great Christ Comet: Revealing the True Star of Bethlehem. Crossway. ^ Interview Greg Cootsona. "What Kind of Astronomical Marvel was the Star of ... - Christianity Today". ChristianityToday.com. ^ Guillermo Gonzalez. "The Great Christ Comet: Revealing the True Star of Bethlehem". TGC - The Gospel Coalition. ^ a b Frank J. Tipler (2005). "The Star of Bethlehem: A Type Ia/Ic Supernova in the Andromeda Galaxy?" (PDF). The Observatory. 125: 168–74. Bibcode:2005Obs...125..168T. ^ Eugene A. Magnier; Francis A. Primini; Saskia Prins; Jan van Paradijs; Walter H. G. Lewin (1997). "ROSAT HRI Observations of M31 Supernova Remnants" (PDF). The Astrophysical Journal. 490 (2): 649–652. Bibcode:1997ApJ...490..649M. doi:10.1086/304917. ^ Edersheim, Alfred. The Life and times of Jesus the Messiah. Peabody, (MA: Hendrickson, 1993), several references, chapter 8. ^ For a similar interpretation, see Minnesota Astronomy Review Volume 18 – Fall 2003/2004 "The Star of Bethlehem by Karlis Kaufmanis" (PDF). ^ Abraham Sachs, and Hermann Hunger, Astronomical Diaries and Related Texts from Babylonia, (Vienna: Verlag Der OÌsterreichischen Akademie Der Wissenschaften, 1988-2014), MUL.BABBAR is used throughout the series, Vol. I-VII (see examples in Vol. III pages: 12, 26, 30, 34, 40, 42). ^ James Evans, The History & Practice of Ancient Astronomy. (New York: Oxford University Press, 1998), 321. ^ Jupiter's synodic cycle is composed of the following: heliacal rising, first station, acronycal rising, second station and heliacal setting. See N. M. Swerdlow, The Babylonian Theory of the Planets, (Princeton, NJ: Princeton UP, 1998),24. ^ Barthel, Peter, and George Van Kooten, eds. The Star of Bethlehem and the Magi: Interdisciplinary Perspectives from Experts on the Ancient Near East, the Greco-Roman World, and Modern Astronomy, (Leiden: Brill, 2015), p. 4. ^ Matthew chapter 2 on Bible Gateway, Amplified Version with footnotes. Retrieved on December 22, 2015. ^ Lawton, Kim. "Christmas star debate gets its due on Epiphany". USA Today. January 5, 2008. Retrieved on December 19, 2015. ^ a b Herzog, Travis. "Did the Star of Bethlehem exist?" abc13 Eyewitness News. December 20, 2007. Retrieved on December 19, 2015. ^ Matthew chapter 2, verse 2. Bible Hub with commentaries. Retrieved on December 19, 2015. ^ Matthew chapter 2, verse 3. Bible Hub with commentaries. Retrieved on December 19, 2015. ^ Matthew chapter 2 verse 7. Bible Hub with commentaries. Retrieved on December 19, 2015. ^ Matthew chapter 2, verses 2-10. Bible Hub with whole chapter and commentaries. Retrieved on December 19, 2015. ^ Gospel of Matthew chapter 2 verse 9. Bible Hub with commentaries. Retrieved on December 19, 2015. ^ Ireland, Michael. "Evidence emerges for Star of Bethlehem’s reality". Assist News Service. Christian Headlines. October 18, 2007. Retrieved on December 19, 2015. ^ a b c Chester, Craig. "The Star of Bethlehem". Imprimis. December 1993, 22(12). Originally presented at Hillsdale College during fall 1992. Retrieved on December 19, 2015. ^ Vaughn, Cliff. "The Star of Bethlehem". Ethics Daily. November 26, 2009. Retrieved on January 2, 2016. ^ a b c d Scripps Howard News Service. "Astronomer Analyzes The Star Of Bethlehem". The Chicago Tribune. December 24, 1993. Retrieved on December 19, 2015. ^ a b Lawton, Kim. "Star of Bethlehem". Interview with Rick Larson. PBS, Religion & Ethics Newsweekly. December 21, 2007. Retrieved on December 19, 2015. ^ Rao, Joe. "Was the Star of Bethlehem a star, comet … or miracle?" NBC News. Updated December 12, 2011. Includes a brief interactive at the bottom, “What’s the story behind the Star?” showing retrograde motion and the 3-2 BC planetary conjunctions. Retrieved on January 2, 2016. ^ a b c d Foust, Michael. Baptist Press. December 14, 2007. Retrieved on December 19, 2015. ^ The Free Dictionary by Farlex; Medical Dictionary. Retrieved on February 12, 2016. ^ Telegraph. "'Jesus was born in June", astronomers claim". The Telegraph. December 9, 2008. Retrieved on December 22, 2015. ^ "History of Christmas". History. Retrieved on December 22, 2015. ^ Josephus, Flavius. ~93 AD. Antiquities of the Jews. Book 17, chapter 9, paragraph 3 (17.9.3) Bible Study Tools website. First sentence of paragraph 3 reads: "Now, upon the approach of that feast ..." Retrieved on March 16, 2016. ^ Josephus, Flavius. ~93 AD. The War of the Jews. Book 2, chapter 1, paragraph 3 (2.1.3) Bible Study Tools website. About one-third through paragraph three it reads: "And indeed, at the feast ...". Retrieved on March 16, 2016. ^ Timothy David Barnes, "The Date of Herod’s Death," Journal of Theological Studies ns 19 (1968), 204–19. ^ a b Andrew Steinmann, From Abraham to Paul: A Biblical Chronology. (St. Louis, MO: Concordia Pub. House, 2011), Print. pp. 219-256. ^ a b W.E. Filmer, "The Chronology of the Reign of Herod the Great". The Journal of Theological Studies, 1966. 17(2): p. 283-298. ^ Finegan, Jack. 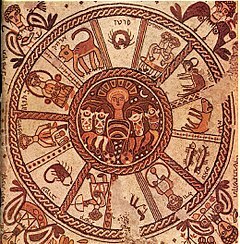 Handbook of Biblical Chronology: Principles of Time Reckoning in the Ancient World and Problems of Chronology in the Bible. Peabody, MA: Hendrickson, 1998, 2015. pp. 238-279. ^ Jesus Christ. Encyclopædia Britannica. Chicago. 2010. ^ Luke 2:2 Luke chapter 2 verse in parallel translations on Bible Hub. Retrieved on March 3, 2016. ^ Ralph Martin Novak, Christianity and the Roman Empire: background texts (Continuum International, 2001), page 293. ^ Raymond E. Brown, Christ in the Gospels of the Liturgical Year, (Liturgical Press, 2008), page 114. See, for example, James Douglas Grant Dunn, Jesus Remembered, (Eerdmans, 2003) p344. Similarly, Erich S. Gruen, 'The expansion of the empire under Augustus', in The Cambridge ancient history Volume 10, p157, Geza Vermes, The Nativity, Penguin 2006, p.96, W. D. Davies and E. P. Sanders, 'Jesus from the Jewish point of view', in The Cambridge History of Judaism ed William Horbury, vol 3: the Early Roman Period, 1984, Anthony Harvey, A Companion to the New Testament (Cambridge University Press 2004), p221, Meier, John P., A Marginal Jew: Rethinking the Historical Jesus. Doubleday, 1991, v. 1, p. 213, Brown, Raymond E. The Birth of the Messiah: A Commentary on the Infancy Narratives in Matthew and Luke. London: G. Chapman, 1977, p. 554, A. N. Sherwin-White, pp. 166, 167, Millar, Fergus (1990). "Reflections on the trials of Jesus". A Tribute to Geza Vermes: Essays on Jewish and Christian Literature and History (JSOT Suppl. 100) [eds. P.R. Davies and R.T. White]. Sheffield: JSOT Press. pp. 355–81. repr. in Millar, Fergus (2006). "The Greek World, the Jews, and the East". Rome, the Greek World and the East. University of North Carolina Press. 3: 139–163. ^ Marcus J. Borg, Meeting Jesus Again for the First Time: The Historical Jesus and the Heart of Contemporary Faith, (HarperCollins, 1993), page 24. ^ Luke 2:2 commentaries on Bible Hub. Retrieved on March 3, 2016. ^ Luke 2:2 in the Orthodox Jewish Bible (OJB)on BibleGateway. Retrieved on March 3, 2016. ^ Luke 2:2 in the New International Version NIV) Bible on BibleGateway. Retrieved on March 3, 2016. ^ Luke 2:2 in the English Standard Version (ESV) Bible on BibleGateway. Retrieved on March 3, 2016. ^ Luke 2:2 in Holman Christian Standard Bible (HSCB) on BibleGateway. Retrieved on March 3, 2016. ^ Brindle, Wayne. "The Census And Quirinius: Luke 2:2." JETS 27/1 (March1984) 43-52. Other scholars cited in Brindle's article include A. Higgins, N. Turner, P. Barnett, I. H. Marshall and C. Evan. ^ Emil Schürer, Géza Vermès, and Fergus Millar, The History of the Jewish People in the Age of Jesus Christ (175 B.C.-A.D. 135), (Edinburgh: Clark, 1973 and 1987), 421. ^ Josephus, Flavius. ~93 AD. Antiquities of the Jews. Book 18, chapter 1, paragraph 1 (hereafter noted as 18.1.1) Entire book free to read online. Bible Study Tools website. Scroll down from 18.1.1 to find Jewish revolt also mentioned in 18.1.6. Retrieved on March 3, 2016. ^ Acts of the Apostles, chapter 5, verse 2 with commentaries. Bible Hub. Retrieved on March 16, 2016. ^ Vincent, Marvin R. Vincent's Word Studies. Luke chapter 2, verse 2. Bible Hub. Retrieved on March 16, 2016. ^ Finegan, Jack. Handbook of Biblical Chronology: Principles of Time Reckoning in the Ancient World and Problems of Chronology in the Bible. Peabody, MA: Hendrickson, 1998. pp. 279-292. ^ Finegan, Jack. Handbook of Biblical Chronology: Principles of Time Reckoning in the Ancient World and Problems of Chronology in the Bible. Peabody, MA: Hendrickson, 1998. p. 301. ^ Finegan, Jack. Handbook of Biblical Chronology: Principles of Time Reckoning in the Ancient World and Problems of Chronology in the Bible. Peabody, MA: Hendrickson, 1998. pp. 289-290. ^ The Desire of Ages, pp. 60.